Yeah !!!! I’m back and cooking. I had rotator cuff surgery and repaired a tear in my right arm 7 weeks ago. Yes my right arm, so how that translates to me is no spinning, no biking, no cooking and basically no nothing. First few weeks are so bad you don’t really want to do much but as you start to feel better you want to do more but can’t because you are stuck in a sling for 5 weeks!!!! This surgery is a bear and sort of unbearable. No choice in the matter I had to do it, so here I am healed up enough 7 weeks later to start cooking again!!!!! Joel and I were so sick of take-out food and eating out 7 days a week . You realize that it’s the little things in life that mean the most to you. I am still not up to very difficult tasks but am healed up enough to whip up this delicious Paprika Shrimp . Not too difficult to prepare but make certain you read through recipe thoroughly before cooking. You too can look like a rock-star and cook up this meal. 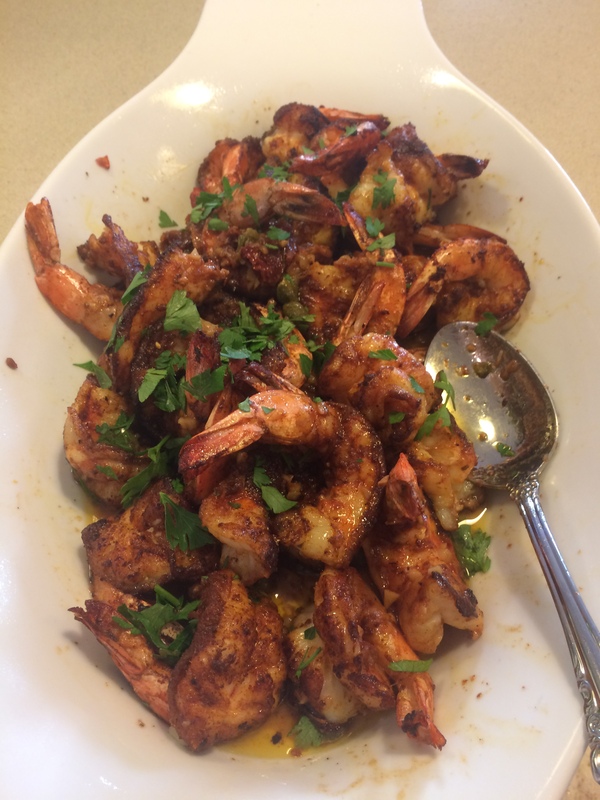 If you like shrimp this is a must try recipe and if you don’t. I called my local fish store in the morning (Roslyn Seafood Gourmet) I asked him to clean and de-vein but ask him to butterfly it as well. Joel butterflied it for me and it’s not that difficult to do it’s just time consuming. I called the fish store in the morning and picked up in the afternoon, so they were all ready for me to cook. I asked for Mexican Whites and the largest he had was Under 15 so this was perfect. I realize that shrimp can be pricey but there is a lot of different shrimp out there priced for every pocket today. So happy to be back cooking and sharing with all of you as I enter into my 5th year of writing this blog. Thanks again for all the support you’ve all given me throughout . Keep Cooking with Candi . 1 Tablespoon finely chopped Italian flat-leaf parsley , don’t leave this out . It gives it a super professional look. In a small mixing bowl, combine the flour, paprika, sugar, salt and pepper. 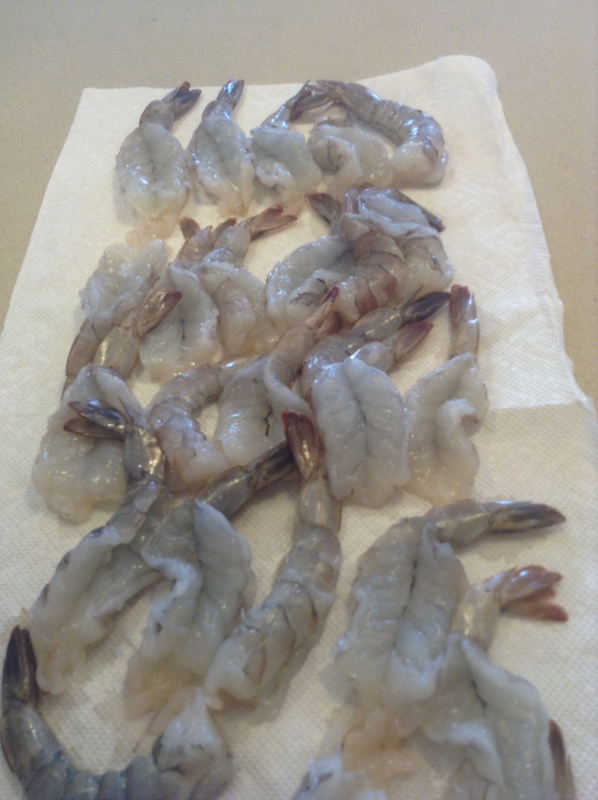 Pat the shrimp dry on paper towels and lay the shrimp out on a rimmed baking sheet. Make sure to cover the shrimp with the mixture. Make sure to get both sides covered. Use all of the spice mixture up. I used my hands to completely cover the shrimp. Heat 1 Tablespoon of the olive oil in a large skillet over medium-high heat. When oil is hot , place half the shrimp in one layer in the skillet. Let cook undisturbed for about 2 minutes, using the timer. Flip the shrimp and sear the other side, for 2 more minutes. Wipe the skillet clean with paper towels before the second batch. Add 1 more tablespoon of olive oil and the remaining shrimp. 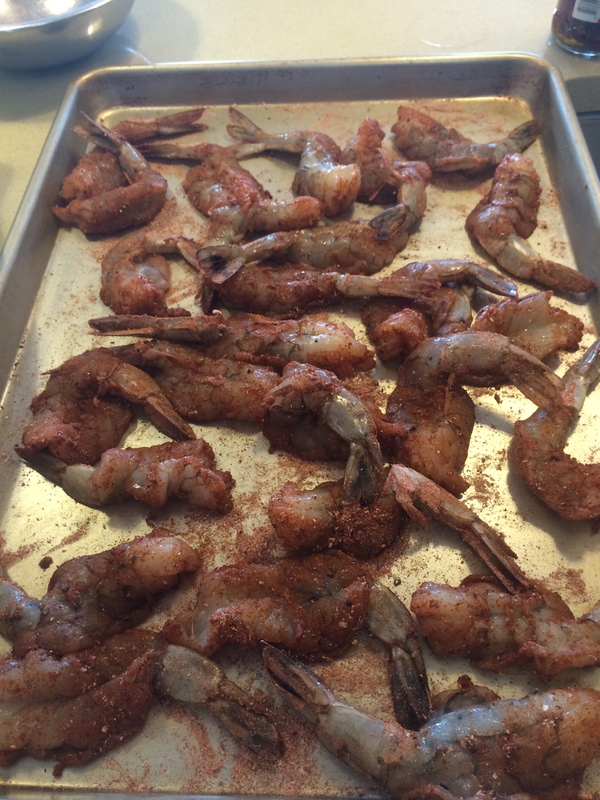 Put the shrimp in a sprayed ( cooking spray) oven-proof baking dish. Place the baking dish in the oven and bake until lightly browned on the edges and opaque in the center. I cooked for 5 minutes. 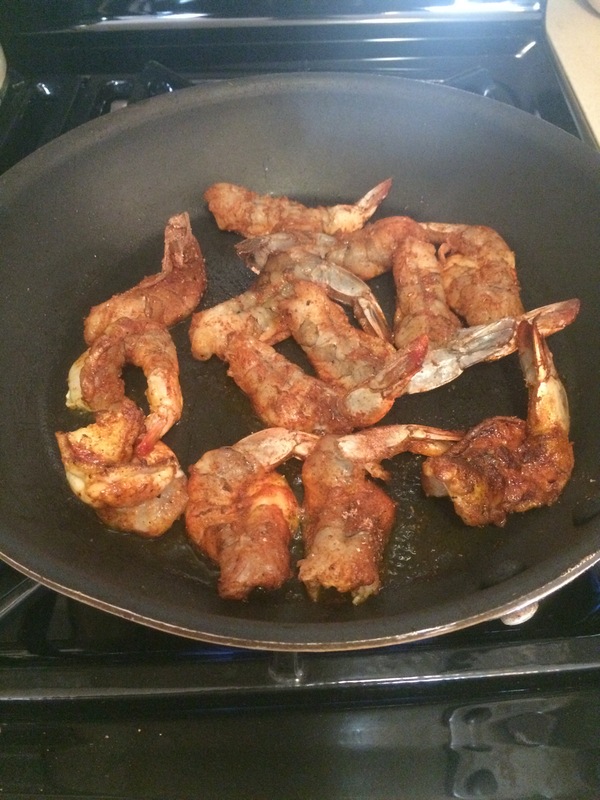 While the shrimp are baking, wipe out the skillet with a paper towel again and return to the stove top over low heat. Melt 1 Tablespoon of the butter. Add the garlic and stir for 30 seconds and be careful not to burn garlic. Add the chopped sun-dried tomatoes and capers, raise the heat to medium-high and sauté for 2 more minutes. Add the wine and lemon juice and bring to a boil. Reduce the heat to medium and cook for app. 5 minutes. Melt the remaining 5 tablespoons of butter into pan. Pour the sauce over the shrimp and stir. Sprinkle with the parsley and serve. I served over rice. Amazingly delicious. 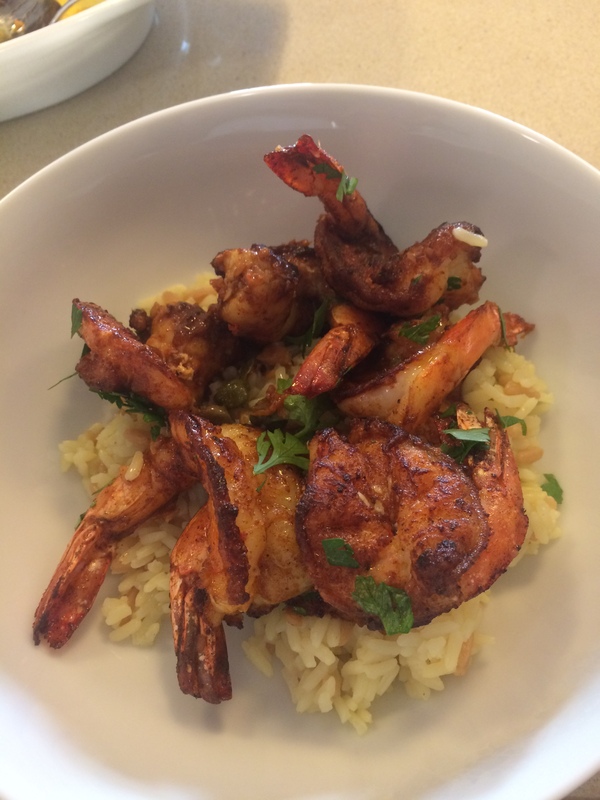 This entry was posted in seafood, shrimp and tagged paprika searesd shrimp, seared shrimp with paprika, Shrimp. Bookmark the permalink. Candi, maybe this is a silly question, but why do you need to pan sear and then bake for just 5 mins? Couldn’t you simply pan sear a teeny bit longer and not have to do the oven part? I like pan searing to give it that sizzle , u probably don’t have to but it would have a different texture and perhaps a different flavor. I did it like us but LMK if you try it this way . Would like to hear the results .